Finnish TV channel have been recently following the activities of Danske Bank International S.A and Nordea Bank S.A. (as well as the Swiss branch) in Spain and to this extent, they traveled to Marbella to film some victims of these highly dishonest individuals. One of these cowboys is the man on the picture, Jesper Hertz, an expert in cheating customers by advising to take out loans against Spanish properties owned outright by expats so that they can avoid Spanish Inheritance Tax. The Finnish TV wants to know how come these bank operate with such wildly diverse standards depending on where they are based i.e. Finland, where they preach the highest values of morality, integrity, honesty, compliance with the laws and, on the other hand, Luxembourg and Spain, which are truly tax evasion laboratories. The Malaga Mercantile Court yesterday held a hearing on ocassion of a misleading advertising case against Nordea Bank Luxembourg S.A. and its Swiss branch. An overweight Jesper Hertz, for the defendants, lied to the Court shamelessly. He confirmed that the bank had never offered any tax or fiscal advertising, information or otherwise to clients and that all they did was offer investment advice. Jesper’s dishonest intervention depicted a scenario of deceipt and will be remembered as the worst example of the hypocrisy and underhandedness of today’s bankers. Nordea’s legal advisor questioned the quality of “advertising” of the promotional literature, stating that it made it clear that such information was not advice, but a mere guidance. They also referred to the date on the main booklet (2008), arguing that it would have been impossible for claimants to have relied on it. Finally, they dismissed the information provided to customers as mere investment guidance, arguing that it was the loss of such investments that had prompted the Nordea’s clients to sue the bank, and nothing else. Claimants were able to prove that Nordea extensive tax advertising was misleading, confusing and inaccurate with the aid of 2 Tax Office binding rulings, the expert witness opinion brought in by the claimants (Carlos Jimenez Dengra) and an abscence of any proof to the contrary by Nordea, save for half-hearted attempts to discredit the evidence brought in by the victim’s legal team. With respect to the booklet date, it was held in Court that previous brochures (2005 and 2006) had inspired the 2008 booklet for identical paragraphs appear on both sets of promotional advertising. It was also held that no where in the advertising did Nordea Bank discuss the product as being an investment proposition but rather, a tax planning tool for the inheritors. The case is ready for sentencing. Marbella Courts have accepted a claim against Nordea Bank S.A., and former Danish Army Sergeant turned Managing Director, Claus Jorgensen, for misleading publicity and swindle. 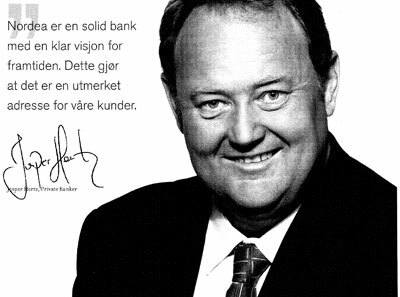 The claim comes as a result of new revelations that would prove that Nordea Bank S.A. ran a tax-evasion scheme in Spain, targeting hundreds of owners of unencumbered homes, whereby a fictitious loan would be officially registered with the main purpose, according to a letter signed by Mr. Jorgensen himself and addressed to the CSSF (Luxembourg regulator), of reducing the value of the property for Inheritance Tax purposes. The loan was then invested in a Nordea-backed “Bancassurance” product, capable of protecting and safeguarding your wealth in order to secure an optimal financial existence for you and your family. According to Nordea’s advertising, the safety of the product was almost guaranteed when admitting that “it is improbable that the Spanish Tax Office will come knocking on your door…”. Caught with their pants down, Nordea’s alibi now is not unfamiliar: “it’s not what you think, we just gave general tax advice but you were urged to seek your own private advisors…”. One has serious doubts about the sanity of the people running this bank: they first issue a booklet called “Guide to Wealth and Tax Planning in Spain”, they then state that it was “merely general advice not amounting to tax advice and certainly not to be relied upon” and finally, they withdraw the booklet from internet 15 days before a pre-trial hearing that was specifically targeting the advertising of the booklet. Mr. Jorgensen, aware or not that this constituted tax fraud, would have been responsible for loan sign-ups totalling 45 million Euros, only in the Malaga province. If this degree of moral corruption is surely intolerable in the Danish Army, why would it be acceptable for a bank? Claus, did you not learn anything in the Army? 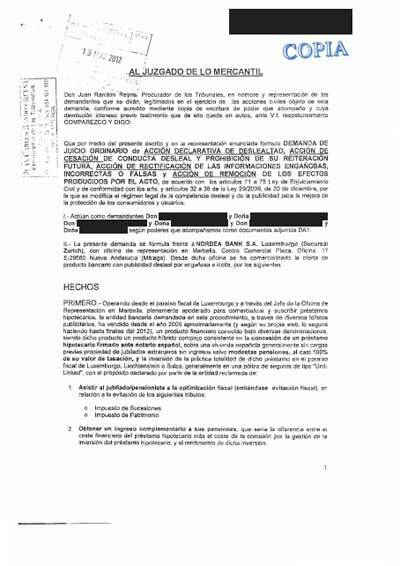 Is Nordea Bank S.A. helping the Mayoress of Marbella defraud the Tax Office? Early this week, ERVA had lunch with a Malaga-based lawyer. The professional (cannot be named), who has taken a serious interest in the Equity Release scam, discussed with ERVA members prior investigations into the dealings of the husband of Mrs. Angeles Muñoz, Lars Broberg, notably how a company owned by both benefited from a political decision: the modification of the boundary-line separating the municipalities of between Benahavis and Marbella. As a result of this wheeling and dealing, the couple ended up dramatically increasing the value of their land. Now you may ask what does this have to do with Equity Release and Nordea Bank S.A.? Answers in a follow up post! 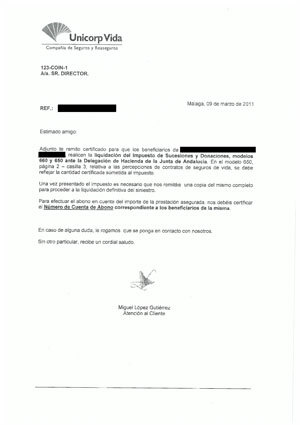 Unlike Nordea Bank Luxembourg, Unicaja is sending letters out to the beneficiary of a life insurance policy requesting proof that an IHT form was returned to the Spanish Tax Office, prior to releasing the funds. The bank even specifies the sum of money that needs to be declared and the appropriate box in the form, and they will not release any payments under life insurance policies until this is verified. Why would Nordea Bank Luxembourg not do this? Very simple, they sold the Unit-Linked policy to precisely avoid the taxes which payment they are legally bound to supervise: the fox looking after the hen house. could see them be prosecuted criminally but by virtue of article 8.b of the IHT Act 1987, they become “substitute taxpayers” if they pay out on life insurance policies without ensuring that the correct tax has been paid, save for the exceptional payment to the Spanish Tax Office, provided that a check is given to the beneficiaries under the policy and such check is written out to the appropriate Spanish tax department. Could lawyers also be taken to task for aiding tax evasion? They could and they would, particularly where their professional and technical skills are used to assist in the commission of fraud. What is the most serious consequence if the client, and his bank, get caught out? Currently, where the unpaid tax exceeds €120,000 per tax year, the taxpayer and his accomplices could face imprisonment (up to 5 years) and more severe consequences if, for example, complex fiscal engineering or tax havens are employed to further the crime. A prison term is just unavoidable unless the taxpayer repents and decides to make a full disclosure, or Statute of Limitations kicks in. Most of the banks are using the “limitation of liability” clause to argue that, whilst “every endeavour has been made to ensure the accuracy of the information provide, we cannot take any responsibility for losses sustained as a result of relying total or partially on it”. This dishonest clause, an indipensable tool in the sales kit of any dishonest business operator worth his salt, was for example used by Nordea Bank Luxembourg S.A. to say that although loads of tax advice was given, they can never be held responsible for it. Inefficacy of limitation or exoneration of liability clauses: clauses limiting or exonerating from responsibility in respect of instances of civil responsibility under this Act are not applicable and thus, inefficacious. life assurance may be the optimal way to mitigate the impact of inheritance tax. This, and more, in 2013 and for Spain. Several Spanish Courts are already ahead of the game on using contractual artifices to evade taxes, pretty much what the Equity Release was all about. The chief difference between both setups is that whilst the ones already set aside were mutually agreed on the understanding that it was illegal to do so, on the Equity Release banks lied as to the legality of the matter and misrepresented the truth. It is reasonable to presume that the profuse and complex series of contracts carried out by the parties answered to a fiscal strategy and, in reality, had no other purpose than to evade taxes…In summary, the object of each of the contracts agreed to was unconnected from the real economical nature that they are intended for, and were rather used seek tax avoidance, once the contracts were succesfully implemented, on the gains derived from the main agreement. No juridical contract can enjoy this status if it is intended to attain a tax advantage, because no tax advantage can be transferred between the parties, and thus such contract produces no effect in respect of third parties…what has been confirmed is a surreptitious avoidance of taxes which none of that parties were entited, directly or indirectly, to legally avoid. We must conclude by asserting the illicit nature of the object of the contract insofar as the aim pursued by the parties was an illegal and immoral business common to both…exemption and tax advatange…without any of the parties being entitled to it. If the contracts are not valid, there is no question of them being set aside and damages being awarded…for they never existed. 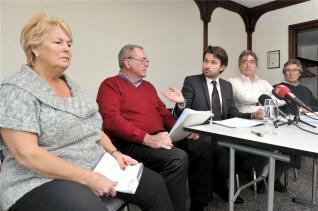 Victims of the Landsbanki Equity Release scam have filed a complaint against the bank Landsbanki for criminal swindle. The lawyers involved in the action, Bernard Maingain and Benjamin Bodig, have presented compelling evidence proving that retirees living in France and Spain, who had small cash requirements to improve their living conditions, were approached by the bank who in turn, offered to mortgage their properties in full and place the proceeds in investments that would generate enough to pay off the costs, and bring an income stream. Far from it; according to the lawyers, upon examination of the product it would have been clear to the bank that this would have never worked because in fact, the proceeds were placed in highly speculative investments. They conclude by calling to the European judiciary to put the means to assist victims and their lawyers in what is a flagrant financial scandal of European proportions. We know what Nordea Bank Luxembourg will say about the part they played in this scam: “we deny any wrongdoing” and “the client always had the opportunity to seek alternative advice”. Certainly clients had the opportunity to go elsewhere to seek true and accurate advice, but they did not, they trusted their inherent Nordic values that John Mortensen and his foot soldiers boasted as capable of “differentiating them from their competitors”. Six Erva.es associates have just launched a claim against Nordea Bank Luxembourg for misleading advertising, pursuant to the 2009 Unfair Competition and Publicity Act. Anyone interested what the Act says can access a summary of it offered by a top UK law firm, or the contents of it, as published by the number 1 law firm in Spain (and who incidentally happens to represent one of the Equity Release banks, one which is willing to negotiate though). And anyone curious to know which advertising is considered misleading can go to the Exhibits section of the writ, where a coloured full-copy of the law-infringing brochures are displayed. The message Nordea put out to people was clear: if you have property in Spain and don’t have a mortgage registered against it, you are endangering the future of the generations to come. On the contrary, if you take out a mortgage loan and invest it with Nordea Luxembourg, you will enjoy the life of Riley, just as the Nordea satisfied family placidly enjoying a catch up and a picnic day out. So much for the Nordic Values…that differentiate Nordea from their competitors. Can you trust this man? Definitely not, if he is trying to sell you a mortgage + life insurance/capital assurance product. Can you trust his company? As above. Why? Because he will be lying through his teeth, as he has done in countless occasions in the past, and will tell you that this product is a fantastic opportunity for expats that have no mortgage on their properties as it will give them access to cash and also, eliminate taxes, none of which is true. Additionally, he will tell you that your property will never be at risk and that you should trust them because of their Nordic values, which he claims other bankers don’t enjoy. So far a few people have had their homes repossessed. What was this man’s role in the selling of Equity Release? Jesper Hertz was in charge of selling and signing off Equity Release products for Nordea Luxembourg in Spain. Wherever his company was not present, like in the Alicante/Murcia areas, he would reach out to potential customers through an agency network of rogue financial advisers, imposters who had easy access to the British expat community through years of presence on the Spanish Costas. Did Jesper Hertz tell his customers that they would never lose their homes? Absolutely. Had he been transparent and honest, not one of his customers’ homes would have been at risk because not one would have signed the product, as simple as this. It was the obligation of Nordea, and Hertz, to specifically indicate their customers that this was a fraudulent product. On the contrary, Nordea’s mission was to come across as an elegant, sophisticated and trusted bank that would look after you to and, as they repeatedly insisted, preserve your wealth and look after your loved ones. Their literature makes ludicrous and false statements such as : home sweet home…your most precious asset…keeping it in the family…our in-house specialists possess a deep and extensive knowledge of these virtues…we ensure that our advice is always open-minded, direct and honest so that we never promise you any more or any less that what is realistic…trust us…let us be your confidant. You are talking about fraud, now that is a serious allegation! Jesper Hertz, from his office in Marbella, marketed, promoted and sold the virtues of a tax evasion cross-border service, similar in concept to the one UBS set in the US that cost them a criminal indictment (PDF). Although far modestly in means and resources compared to the Swiss bank, Nordea has still managed to create a refined set of promotional brochures that minutely explains how legal it is to register an artificial mortgage on your home, take the proceeds to a tax haven and have your inheritors receive the money abroad, without paying taxes, whenever you pop your clogs. Why is it all wrong then? The problem is that you cannot register an artificial mortgage to make the tax authorities think that you have a real one, it is just illegal. And yet, Nordea Luxembourg organized a marketing campaign based on this premise. Secondly, it is wrong to tell your customers that you can inherit the proceeds of a life insurance/assurance product without paying taxes, quite simply because the law says that you pay IHT in Spain, whether you are a resident or a non-resident (and irrespective of the policy-holder being a resident or not). How would you summarize Nordea Luxembourg Equity Release product? Tax cheating, customer deception and lack of values, all in one.